A Sensor Box is required for use with environmental or other sensors used in your data acquisition. 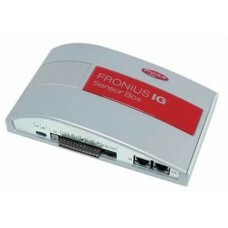 It is possible to install various sensors into the Fronius DATCOM system. These permit an in-depth look into the way the PV system works and makes it possible to draw informed conclusions about the overall performance. Each Sensor Box allows connection of up to six sensors: 2 temperature channels (PT 1000), 1 irradiance channel (Voltage input 0-1V), 2 digital inputs, 1 standard 20mA current interface. *This product is available either as a plug-in card or as a box. Plug-in cards are recommended for a maximum distance of 20 – 30 m between the inverter and sensor(s). Larger distances can be bridged using the box.